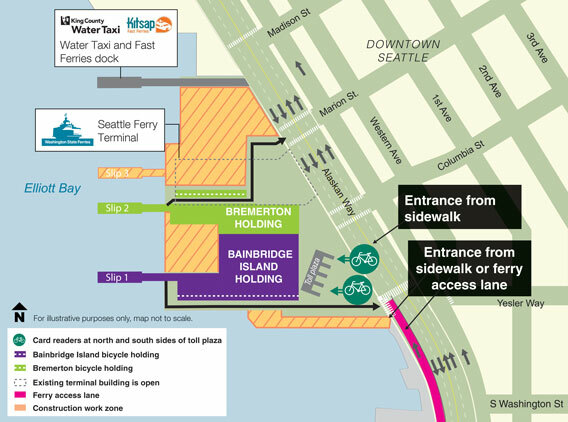 Welcome to the Seattle waterfront construction information site! Seattle's Central Waterfront is going to be a busy place over the next several years, with multiple construction projects underway. To make it easy for you to stay up to date on what's going on and what's ahead, we've compiled project information all in one place. This site provides general information about current and future public projects. For additional project details, visit the project websites, which can be found in the “Contact Us” page. 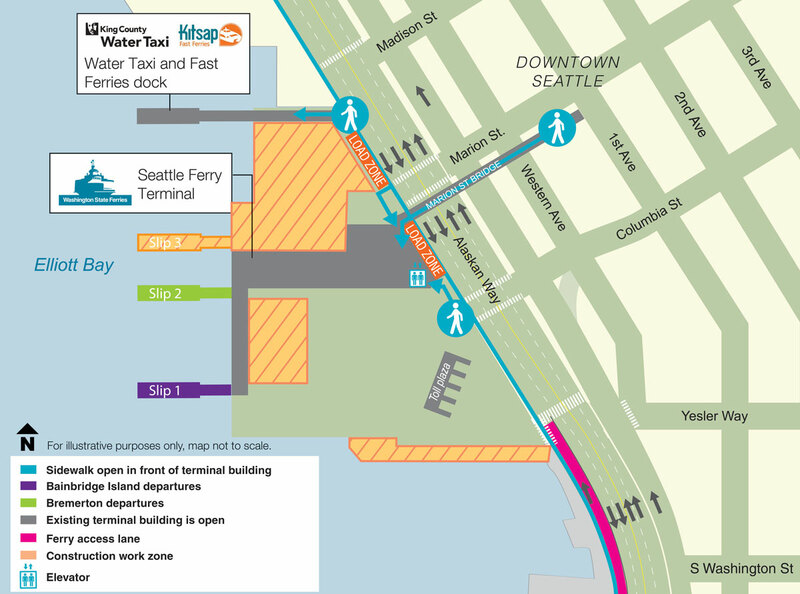 Washington State Ferries is replacing the aging and seismically vulnerable parts of Colman Dock in Seattle in order to maintain its critical role as a regional transportation hub. Project construction began in 2017 and will continue through early 2023. The terminal will remain open throughout construction. The contractor will complete most work from barges on the water, however, construction work zones on the dock will limit vehicle holding capacity. Ferry service will maintain the same number of daily sailings as the current schedule. 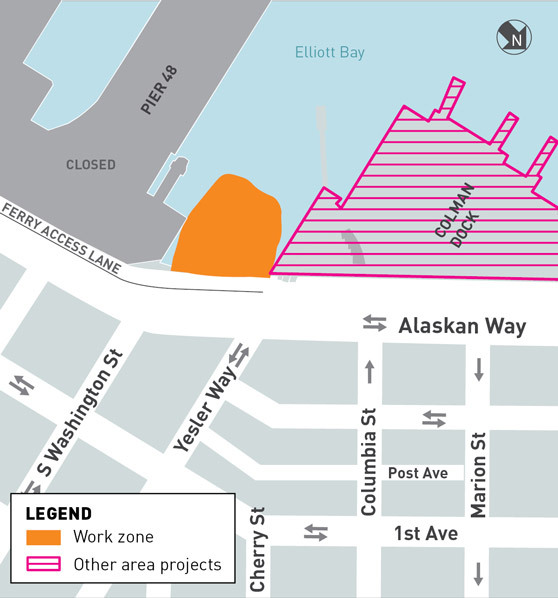 This fall, work will take place on both the south and north sides of Colman Dock. Bremerton and Bainbridge Island vehicle holding areas will continue to change. View our Colman Dock Project construction web page to stay up to date. Bremerton vehicle holding is in the middle of the dock closest to the terminal building. No trucks over 40-feet long permitted on inbound sailings from Bremerton to Seattle. Bainbridge Island vehicle holding is on the south side of the dock. Bicycle card readers on both sides of the toll plaza. These card readers will remain throughout construction. Bainbridge bicycle holding in the southernmost lane (lane 1). Bremerton bicycle holding in the northernmost lane (lane 30) This lane will be shared with motorcycles, with line designating space for both modes. 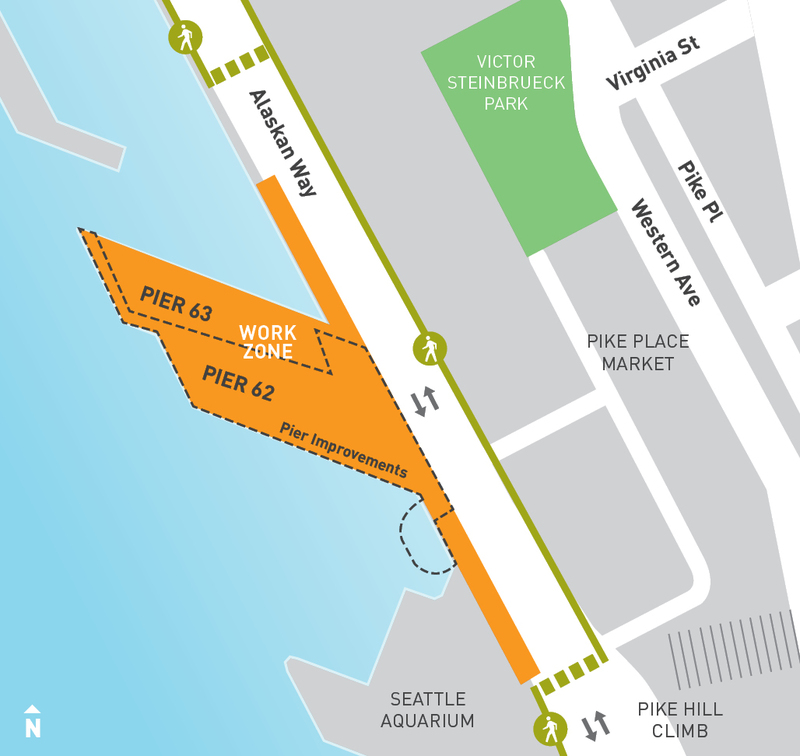 The passenger load zones remain in front of the main terminal building on Alaskan Way between Madison and Columbia streets. The pedestrian connection to the Marion Street Bridge remains open. 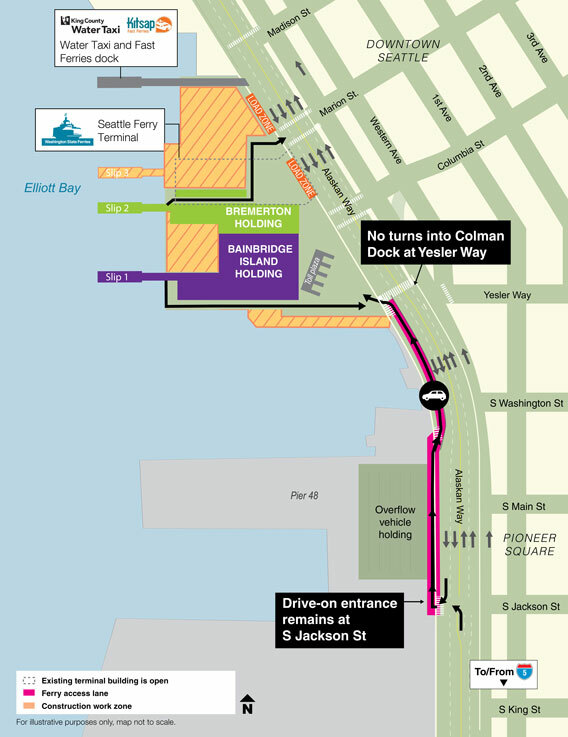 The passenger-only ferry facility has been temporarily relocated to the north side of Colman Dock. Passengers enter from Alaskan Way between Madison and Marion streets. The Waterfront Seattle project is rebuilding Pier 62, including replacing the aging wood pilings and deck, and provide new railings, lighting, utilities and a floating dock. During construction, the pier is closed to the public. Removing the Alaskan Way Viaduct between Railroad Way S and the Battery Street Tunnel. The work began in early February 2019 and will take approximately six months. Crews will remove the viaduct in sections, to reduce the work duration at any given location. Work will occur at multiple locations at once. At most locations, crews will remove a frame of the viaduct within 30 days. This 30 day period includes time for staging and prepping the work area, demolishing the viaduct, and restoring the work site. Visit the program website for more details about work methods and schedule. Construction on marine habitat enhancements just south of Colman Dock and west of Alaskan Way began in late October (see map below). The work will create an intertidal area to improve the function of the natural ecosystem along our urban shoreline. The work will have no impact to parking, pedestrians or vehicles. This area will remain closed to the public until 2023 to allow enough time for plant establishment. The contractor will close lanes only in immediate proximity to active construction. One lane of Alaskan Way will be open in each direction adjacent to active construction. Elsewhere, two lanes will be open in each direction. There will be no fixed bicycle/pedestrian detours during construction, as the work zone will be frequently moving up and down the structure. All drive-on customers, including cars, trucks, vanpools and motorcycles enter from S. Jackson St. Passenger pickup and drop-off access will remain in front of the terminal building on Alaskan Way. There are no changes to access for people walking or biking onto the ferry. The west side trail will remain closed for the winter between Lenora and Pike streets and will reopen by Memorial Day. Road restoration work on Alaskan Way near Pike Street has been completed. The four lanes of Alaskan Way, the Pike Street crosswalk and the Pike Place Market Garage driveway are now open. For more information on current construction activities, click on the projects on the map to the left, or select a project from the list above. Want to know more about plans for future construction? Visit the “What’s Ahead” page where you can view construction information year by year. Or click on the “What’s Ahead” tab above and select the year that you want to know more about. Printer friendly maps showing general timing of construction of the various projects along the waterfront are also available. If you’re planning on visiting the waterfront, check out the “Travelers' information” page to help plan your trip, find parking info, and check out current traffic conditions. Have questions or comments? Find agency contact info on the “Contact Us” page. This site was developed and will be maintained by the Seattle Office of the Waterfront, with support from: Washington State Department of Transportation, Washington State Ferries, Seattle Department of Transportation, Seattle City Light, Seattle Public Utilities, and King County.